The NFL is entering Week 3, with a full slate of games to choose from. DraftKings will be offering a wide array of contest, and most have a $50,000 salary cap. This is one idea for a lineup to utilize all $50,000. Week 3 kicked off with the Rams and 49ers on Thursday night. Luckily for players on DraftKings that game holds little fantasy value. Most players tend to jump on Sunday and Monday action over any Thursday night. The Thursday games are typically sloppy and low scoring. The short week and limited recovery time also means injury concerns are tough to manage. With the exception of Tyreek Hill and Cole Beasley, every player scored double digit points. Tom Brady and Rob Gronkowski had the monster game that justified their stack against the New Orleans defense. Cohen and Montgomery played well with Montgomery dominating the DraftKings’ PPR format. Speaking of dominating PPR, Keenan Allen and Jarvis Landry again look to be the PPR kings they’ve shown in the past. 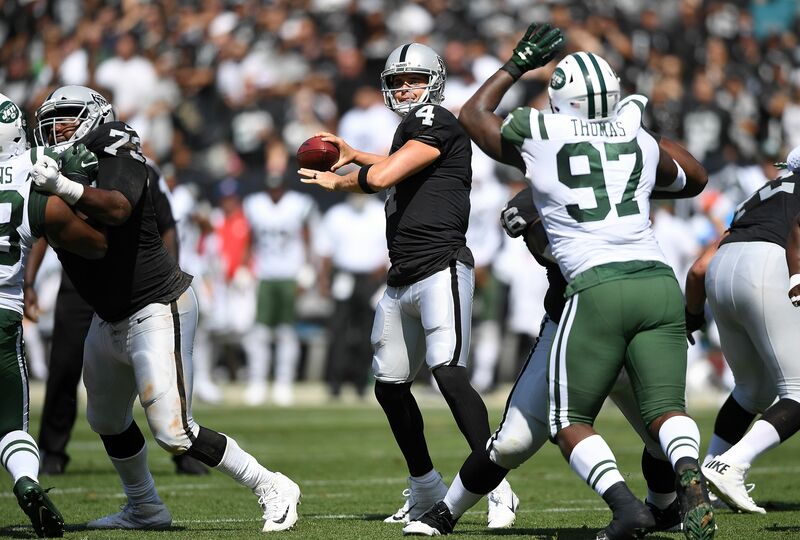 The Raiders defense made easy work of the Jets but lacked those interception or return touchdowns that makes fantasy defenses relevant. In Week 3 there are two familiar faces for the $50,000 salary cap line-up and a few interesting names. The line up below utilizes all $50,000 and a mix of high profile players and value contributors. To start, Derek Carr is playing the Washington Redskins in what could become the highest scoring game of the week. Las Vegas agrees as it currently holds the highest over/under of any game on Sunday. Last week that title went to the Saints and Patriots who combined for 56 points. At running back, Jay Ajayi is DraftKing’s third ranked running back. Even carrying a questionable tag going into the week all signs point to Ajayi playing. He gets the Jets this week who are dead last in the league against the run. The Dolphins have shown that Ajayi will be a workhorse three down back, only missing four offensive snaps from the team last week. Theo Riddick is the perfect DraftKing’s running back this week. He excels at catching the ball out of the backfield. The Lions also get to play the Atlanta Falcons who let Ty Montgomery have the monster game catching the ball after Tarik Cohen torched them in Week 1. Riddick will be utilized more than backfield partner Ameer Abdullah because the Lions will likely be trailing and Riddick is the better pass catcher. Some big money was thrown at the wide receiver position but with separate ideas for each player. Allen is a PPR nightmare and a consistent player. He is worth his high price simply based on consistency. Tyreek Hill is the polar opposite. The targets should be there but the touchdowns will really make or break Hill as a fantasy player. Luckily Andy Reid will utilize him in the slot against the Chargers defense who allowed Landry’s big game from the same spot last week. The other two wide receivers that make the list are based on opportunity. Devin Funchess, in my eyes, will be the beneficiary of the Greg Olsen injury. Kelvin Benjamin will get matched up with rookie corner Marshon Lattimore who may be the only bright spot on the Saints defense. This leaves Funchess and rookie running back Christian McCaffrey as Newton’s go to targets. The Saints defense is again historically bad and points will be available for all Carolina’s offense. Rishard Higgins is another beneficiary of injuries. He is listed as the starter opposite Kenny Britt for the Browns. Cleveland gets the Colts on Sunday who are a defense almost as bad as the Saints. Higgins had a monster game last week and should see the same volume of work this week. The practice squad player is looking like a steal at only $4,000. Zach Ertz makes the cut at tight end because of his matchup with the New York Giants. Ertz is second on the team in targets with 18, two behind Alshon Jeffery. He is the team’s leading receiver with 13 receptions for 190 yards. The Giants have surrendered a touchdown to a tight end in back to back weeks. Finally the Steelers defense has impressed all season. This week they get the Chicago Bears and turnover happy Mike Glennon. Against the Buccaneers in Week 2, Glennon threw two interceptions, and was sacked four times. The Steelers are tied for second in the NFL in sacks and top five in opposing passing yards per game. Glennon is in trouble in Pittsburgh. The Steelers defense is DraftKing’s fifth-ranked defense but $3,400 is cheap enough to justify their selection. This lineup takes every cent of the $50,000 cap. There is no stack this week but the big money players again will be the reason this lineup wins or loses. Jay Ajayi needs to dominate the Jets while Carr, Allen and Hill need to meet or exceed their expectations.